This undated illustration provided by Tinder/Emojination shows new variations of interracial emoji couples. In the world of emojis, interracial couples had virtually no options in terms of skin tone. But the emoji gods, otherwise known as the Unicode Consortium, recently rectified that, approving 71 new variations. 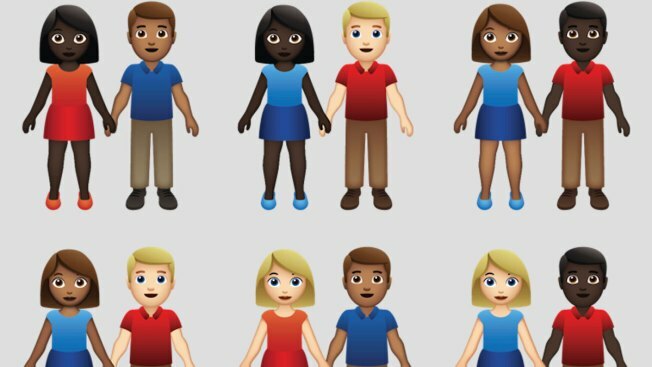 Using six skin tones already available for one-person emojis, vendors such as Apple, Google and Microsoft will now be able to offer couples of color. Additions are expected later this year. In 1664, Maryland passed the first British colonial law banning marriage between whites and slaves. An 1883 U.S. Supreme Court ruling that state prohibitions on interracial marriage don't violate the Fourteenth Amendment held for more than 80 years. Capping a yearlong project thought up by, of all people, the folks at the swipe-right dating app Tinder, the emoji gods (known as the Unicode Consortium) recently approved the additions in characters technically referred to as people "holding hands." A new "gender-inclusive" couple emoji was also approved among 230 new characters.